HomeCompany NewsCo-op Experience With CloudChoice Inc.
CloudChoice Inc was created in 2016 by Andrews Moses. Andrews left a company called FreshDesk after working there for 5 years to start CloudChoice. Now, CloudChoice has many different partners selling all kinds of customized SaaS applications. We are resellers of FreshDesk (customer support), FreshSales (CRM), Hippo Wiz (Online Video Platform), FreshTeam (Recruitment), FreshService (IT Helpdesk) and even our own product called M2O Apps (Inventory Management). We have recently worked with GNCC and Regent Student Living to help reinvent the way their business is being done. My direct position with CloudChoice was Digital and Social Media Marketing Coordinator. However, because the company is a start up I have many different tasks. As Marketing Coordinator, I am responsible for creating creative content that drives people to our website so that they can see our services and products. I generally include a link that allows the user to click on and it brings them to a landing page with a 30-day trial. I also do a YouTube video twice a week, to show the users “how to” videos on using the product. Check out my post popular video here that is getting a lot of attention. I give demos of the product as well, walking the users through the entire process of setting up an account and using the tool. Furthermore, I post on Instagram, Twitter, LinkedIn, and Facebook to drive traffic to our website. I create attractive images to appeal users to read more about our posts. Additionally, I write a lot of blogs to give value back to our followers . Also, I use a lot of key words such as FreshDesk consultants to facilitate further SEO which in return brings more traffic to our website. Moreover, I am also a product consultant so I have to manage accounts and ensure that the client is happy with the product. This means that I have to answer any technical question they have. I also have to sell these products. 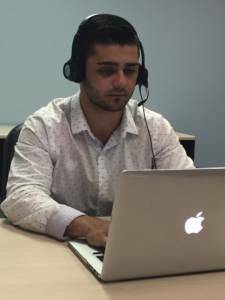 When working with clients I listen closely to their problems and find a solution to solve their problem through a customized SaaS software. Once they are interested in the software we then implement the software for them and teach the team how to use the tool. This process generally takes 3 weeks to get everyone up to speed, that is why it is so important that I create these YouTube videos for our clients to watch. Then once we implement it, we give them a proposal for them to sign and pay based on a number of users and time we put in through consulting. After, we maintain a close relationship with our clients and continue answering any questions they have. Coming into this position I had very little experience in the SaaS industry as I am not a very technical person. But I always seek to learn more and more each day. That is what kept me driven, and my ability to create personable relationships with our clients is what made me stand out to Andrews. With such a strong background in sales and marketing, I was able to push all the services and products to new leads with ease. Furthermore, I was able to work closely with Jackie Crawford from the Brock University Co-op Office who helped me throughout my work term. I am very grateful to have them back me and honoured to represent Brock! Also, I recommended to Andrews that we get more involved at Brock through Service Learning. Service Learning allows business students to apply what they learn in class to a real life business problem. So we told the MBA students of an entrepreneur class to help us grow our business. They provided us with some valuable insights into competitor analysis, trends, and further ways to penetrate the market. I was also to bring some valuable insight forward as we were creating our very own inventory management solution. This was one of my favourite parts while working with CloudChoice because I was able to request and add new features that I thought would be valuable to the end user. I would call our target market directly and conduct a problem interview where I would look for key pinpoints that they wanted to be solved. I would then use these pinpoints and add them to our features list. Lastly, I am currently one the Directors of Corporate Relations with the Goodman Business Students Association. My main role is to connect with local businesses in the Niagara/ St Catharines region and gain a sponsorship. 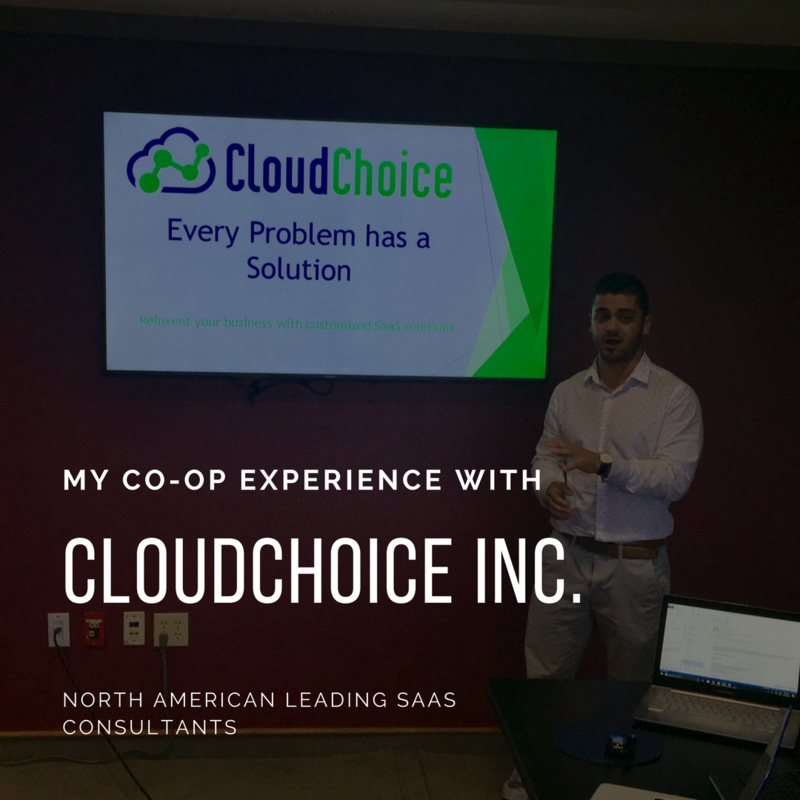 While working with CloudChoice I was able to make many long lasting connections that allowed me not only to network but gain new partners. In all, it was a great experience and I am so grateful to work under Andrews as he taught me so much that you really can’t learn from anywhere else. I plan to continue growing based on the experiences I learned with CloudChoice in order to enhance my future career opportunities.